My original plan was to photograph the full moon. But unfortunately the bad weather has stopped me doing so… The sky was too cloudy and the moon was not visible at all. But that’s nature! That’s why you always need a “Plan B”. In this case, I had to look for a new object. 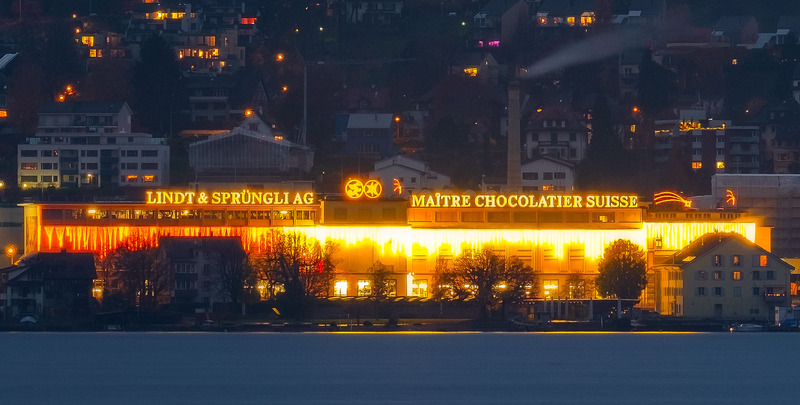 On the opposite side of the lake is my place of residence and also the home of the famous chocolate factory “Lindt & Sprüngli”. We are slowly getting into the Christmas season and the whole factory shines in full festive lighting. Sometimes you have to make the best of the situation. It is certainly too early to wish you all a Merry Christmas. That’s why I say: Cheers! My car is a DeLorean! Life in plastic is not fantastic!